CHEONAN, South Korea, Oct. 16 (Yonhap) — Tottenham Hotspur forward Son Heung-min on Tuesday collected an assist in his final match for South Korea this year, wrapping up his tight international schedule. 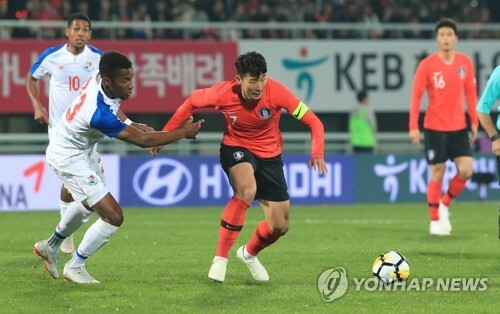 Son, wearing the captain’s armband, played full time in South Korea’s 2-2 draw with Panama in a friendly match at Cheonan Stadium in Cheonan, South Chungcheong Province, his last international match in 2018. South Korea are scheduled to face Australia and Uzbekistan next month, but under the agreement between the Korea Football Association and Tottenham, the 26-year-old will not be available for the November friendlies. The two sides previously agreed that Son would not play in South Korea’s friendlies in November and the first two matches at the Asian Football Confederation (AFC) Asian Cup in January in a trade-off for the player’s Asian Games appearance this summer. Against Panama, Son, as usual, was the engine of South Korea’s attack. Although he didn’t score a goal, Son facilitated the team’s attack with his dribble and sharp passes. In the 21st minute, Son threaded Hwang Hee-chan a through ball, but the Hamburger SV forward failed to convert with his right-footed strike. But Son bagged an assist in the 32nd when he fed Hwang In-beom with a pass from the right side of the box. In the 59th, Son attempted a free kick to put South Korea back in the lead, but was denied by Panamanian goalkeeper Luis Mejia. Son has gone through a tight international schedule, having in recent months taken part in the 2018 FIFA World Cup in Russia and the 18th Asian Games in Indonesia. Son played 13 matches for the senior national team in 2018, scoring three goals. For the under-23 team at the Asian Games, which he participated in as one of the three overaged players, Son performed in six matches and scored one goal. In total, Son played 19 matches for South Korea this year, by far the most he has played in a single year. Previously Son competed in 12 matches for South Korea in 2014 when the World Cup was staged in Brazil. Despite the hectic schedule, Son had another solid international season. So far, the only South Korean player who has scored more goals than Son for the senior team this year is Kim Shin-wook, who netted four goals. But all of Kim’s goals from friendly matches against lower-ranked teams. Son could have easily surpassed Kim if he had converted penalty kicks in recent friendly matches. The former Bayer Leverkusen man missed penalties in friendlies against Costa Rica and Uruguay. Still, Son scored valuable goals against top class teams. Two of Son’s three goals in 2018 came in the World Cup, where South Korea faced Sweden, Mexico and Germany. Son scored South Korea’s only goal in their 2-1 loss to Mexico and the team’s second goal in a stunning 2-0 win over Germany. Son’s biggest achievement this year would be winning a gold medal at the Asian Games. Hwang Ui-jo was the top scorer for South Korea with nine goals, but Son was also pivotal for the U-23 team’s gold medal run, producing four assists. He was also captain of the U-23 team. The Asian Games gold gave Son an exemption from mandatory military service, which enables him to continue his career in Europe without interruption. Under new head coach Paulo Bento, Son’s status hasn’t changed. Wearing the captain’s armband, he started in all four matches. With his national team duty completed for this year, Son will now be focusing on his campaign with Tottenham until he resumes international duty in January. Son has yet score a goal for Tottenham this season. He has so far played five English Premier League (EPL) matches and two UEFA Champions League matches. Son said after the match against Panama that he feels tired but will work to overcome the challenges. Son didn’t score in his last four matches under Bento, but he said what he cares about the most is the team. Son said he’ll try to stay healthy and will recover his form until he returns to the national team for the Asian Cup.